Do I need to be a runner to participate? Absolutely not! There lots of other great run/walks out there that focus on timing and performance. COLOR FEST is all about sharing a fun day with friends, family and our larger communities. We encourage runners, walkers, strollers, dancers and skippers along the route! If you registered before our early bird date of March 12th, you will receive an official COLOR FEST 2017 tee-shirt and sunglasses. If you registered after March 12th, you are registered to participate in the event and will receive sunglasses. COLOR FEST merch will be available at the launch party and at the merchandise table at COLOR FEST. Merch quantities are limited and are first-come/first-serve. How do I get the tee-shirt and sunglasses that come with my early registration? We strongly encourage you to come to the Launch Party held prior to COLOR FEST to pick up your tee and/or sunglasses, meet other runners, and find out more about what your participation in COLOR FEST supports! You may also pick up your tee and/or sunglasses the day of the event at the registration table. Can someone else pick up my items for me? YES! As long as you send them with a printed or electronic copy of your confirmation email. Absolutely! This is a family fun event! Young people aged 5 and under can participate in the run/walk or block party for FREE! For the safety of our runners and animal friends, we do not allow animals to participate in the run. Pets are invited to join us for the Block Party and we ask that they stay in the Block Party space for the duration of the run. How is the color powder/color liquid administered along the course? You will see smiling faces along the route whose main goal is to douse you in colorful powder/liquid to ensure that you look like you ran through a rainbow by the time you cross the finish line. Yes! You will see a few bubble machines along to route to denote you are still going the right way. Bubbles will be made from non-toxic soap. Is the COLOR FEST safe? What’s in the powders and sprays? The health and safety of our participants, volunteers and staff is at the forefront of our minds and actions. All of the powders are made from non-toxic corn materials and non-toxic dyes. We recommend if you have eye allergies or asthma to consult with your doctor before participation. We also encourage you to wear a bandana over your mouth, sunglasses to cover your eyes and encourage stroller covers for our youngest COLOR FEST participants. Do the color powders/color liquid affect runner/walker vision? Or breathing? The color powder used at COLOR FEST is all certified non-toxic and non hazardous. Our bright colors are a combination of non-toxic materials and FD&C dyes. As with any substance, you want to keep it out of your eyes and our color throwers/sprayers make sure to aim low as you pass by. Some runners/walkers opt to wear glasses or goggles for their eyes and use a bandana or dust mask for their mouths. Both glasses and bandanas will be available at the Launch Party and day of the event. Quantities are limited. How do the post run/walk color throws work? At the Block Party, you’re invited to participate in a color throw to celebrate your successful completion of the run/walk. We provide one bag of color for each runner - as you cross the finish line. Will the color ruin clothes or running shoes? The color does mostly wash out after the event. As with any stains, the sooner you wash it the better. We suggest wearing items that you don’t mind getting colorful. How does the color affect the inside of cars? Most people bring some towels for the insides of their car or a change of clothes just in case. Can spectators watch the run/walk and attend the Block Party? Absolutely - we encourage it! Spectators, cheering groups, supporters and fans are welcome to watch the run/walk. You can register to attend the celebratory Block Party at www.efli-life.org/color and can also register the day of the event. Are cameras and phones safe to have in the color zones? Photographers are generally fine shooting from a medium distance of 50 feet, but to be totally safe we always recommend covering cameras/phones with a protective dust wrap. Those colorful powder particles are sneaky and the Eileen Fisher Community Foundation is not liable for any damage that might be done to your camera, phone or other electronics. If an event is held, we cannot issue refunds. The logistics of setting up and planning the event make it impossible. Just make sure you are good to go before signing up. If for some reason you can’t make it to the event, at least come to the Launch Party, pick up your gear, and say hello to us! In the case that severe weather or some unforeseen act does threaten the event, we will refund your registration fee 50%. Registrations are non-transferable. If you end up not being able to attend the event, know that your registration fee is going to an amazing cause to support and serve young people in Westchester and beyond! If you have an ADA need, please contact us at development@efli-life.org or call us at 914-487-3354. It’s completely up to what you and your doctor decide. We recommend wearing sunglasses or goggles and a bandana over your mouth and nose when passing the color stations - just for a bit of extra protection. A little rain won’t stop COLOR FEST. It is a rain or shine event! In the case that severe weather or some unforeseen act does threaten the event, we will refund your registration fee 50%. Is the Eileen Fisher Leadership Institute a non-profit organization? YES! The Eileen Fisher Leadership Institute is a non-profit 501(c)(3). 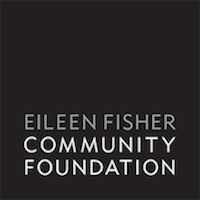 We are an initiative of the Eileen Fisher Community Foundation. What does my participation support? EILEEN FISHER LEADERSHIP INSTITUTE: Proceeds from COLOR FEST 2017 benefit financial aid funds for participation in Eileen Fisher Leadership Institute programs. These powerful programs support young people to find and proclaim their voice, develop personal philosophies of success, and engage as agents of change in their communities and the world. After completing an EFLI program, 96% of participants said their confidence rose, 89% felt a stronger sense of self and 85% felt a greater sense of community. The Eileen Fisher Leadership Institute is an initiative of the Eileen Fisher Community Foundation. RIVERKEEPER: Riverkeeper’s mission is to protect the environmental, recreational and commercial integrity of the Hudson River and its tributaries, and to safeguard the drinking water of nine million New York City and Hudson Valley residents. What if I have a super sweet question that isn’t answered here? Please to contact us at info@efli-life.org or 914-487-3354 and we will get back to you with an answer. If your question is awesome enough, we might even publish it right here on the official COLOR FEST FAQS page. EFLI is an initiative of the Eileen Fisher Community Foundation, a 501 (c)(3) non-profit. EFLI’s mission is to promote leadership in young people through self-empowerment, connection with others, and activism in their communities.